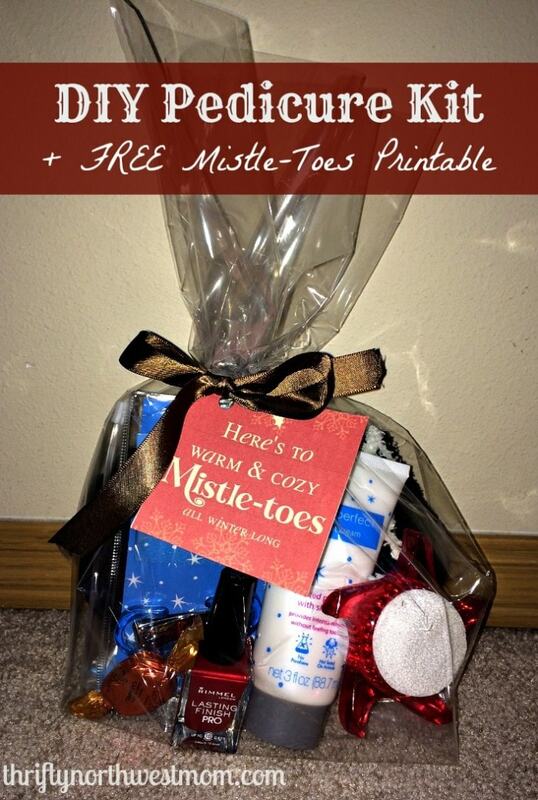 If you’re looking for a fun last-minute gift for a teacher, girlfriend, neighbor or stocking stuffer gift idea for a teenage girl, this is a super easy & frugal gift. 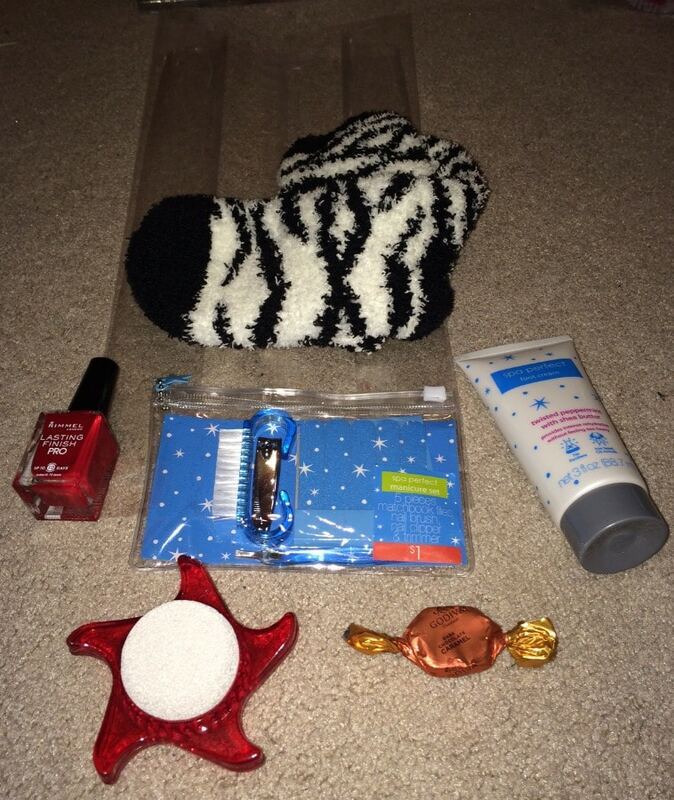 Put together a bag full of fun items for a DIY Pedicure Kit and if you combine coupons & sales, you could spend around $5 or less depending on how much you put into your kit. Plus we’ve made it easy for you by creating a FREE printable Mistle-toes gift tag (prints 6 to a sheet) for you to use for your gift bags! I made these bags for my MOPS table gals this week and it was a fun little gift for busy moms. It was a reminder for them to make time for themselves during this holiday season. But it could be a great gift for teens to give to their friends or for you to give to your girlfriends. It would also be fun for a gift exchange. I kept my cost down by buying items at the Target Dollar Spot, as well as nail polish on clearance & combining a sale with a coupon at JCPenney for the cozy socks. It all cost me around $6 total, but depending on what sales & coupons you have & how many items you put in here, you could definitely keep it under $5. 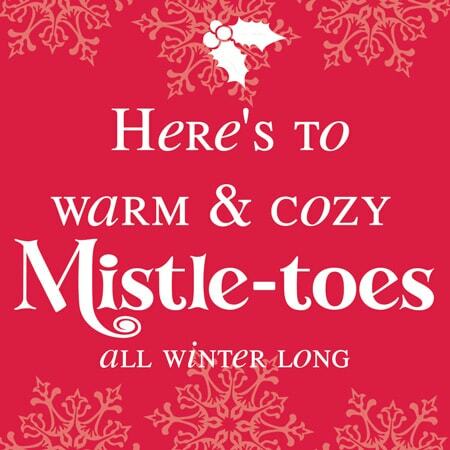 We created a FREE printable tag for you to use with your DIY Pedicure kit which is perfect for Christmastime with the “Mistle-toes” theme. It will print out 6 tags per sheet. Just click here to save the printable to your computer and then print away! It is more of a brighter red color as shown above – I just didn’t have any white cardstock so I used creme, which made it more muted colors in my pictures. Clear Plastic bags – I got these with hand soaps I bought at Bath & Body Works (they are free if you buy products there right now for Christmas), but decided to use for my pedicure kits instead. You can buy these bags at Michaels & use coupons to bring the price down. Thread ribbon thru hole & then make a bow & it’s all ready to go!